Pssst! Don’t tell anyone these are whole wheat! Just tell them you made delicious apple pancakes for breakfast. Even I was surprised how soft and fluffy these yummy pancakes are. And there’s a ton of apples in there. I use a huge Granny Smith apple that usually weighs over a half pound, which I peel, core, and dice into 1/2- inch pieces. The batter is thick and lumpy and that’s a good thing. This is my basic buttermilk pancake recipe that I use for blueberry pancakes too. And buttermilk makes the best pancakes! The key to great pancakes is not to over-mix. Never use an electric mixer. Just combine the dry and liquid ingredients together gently by hand until just barely combined. Some bits of visible flour is fine. Then fold in the apples… gently… and you will have a thick and lumpy batter. That’s perfect. If buttermilk is not available where you live, look at my “Substitutions” blog category. You can make your own but the real thing is better. For cooking my apple pancakes, I use a non-stick electric griddle but you can make pancakes in your largest flat pan. If it’s non-stick you don’t need to grease the pan at all but if you like, you can rub the pan first with a stick of butter. 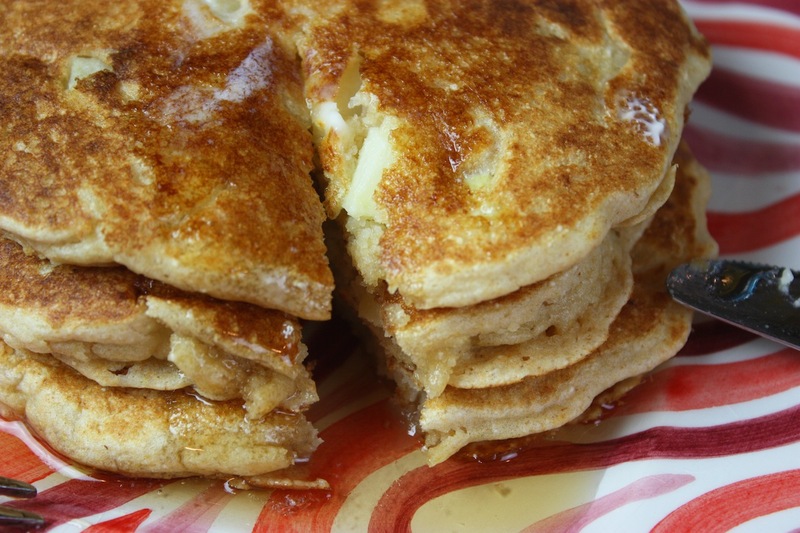 4 Comments on "Fluffy whole grain apple pancakes"
Hey Jenny, Made these for my husband and I this morning, best pancakes, and I have made a lot over the years. I love the fact that there is no sugar. I did add some of my homemade vanilla. Oh, and I used as syrup my homemade pineapple jam(warmed up). Thank you for all your hard work in preparing such great recipes!! I so do enjoy your videos too, you crack me up. These sound wonderful! Another great recipe from you! Many thanks. I’ll let you know when I try these. They seem to be with a solid recipe.